The mission of the Colonial Beach Artist Guild is to bring more visual arts to the community and offer educational opportunities, while sharing interests and having fun. Founded more then five years ago by seven local artists, the guild now numbers nearly 70, most of whom are practicing artists. They sponsor a year-round Second Friday Art Walk as well as public workshops which have attracted visitors from Virginia, Maryland, Pennsylvania, the Carolinas and even as far away as the U.K. and India! 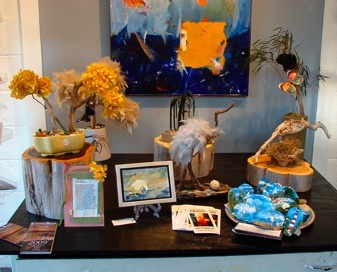 During the month of July, they sponsor the Potomac River Regional Art Show & Sale. This event attracted more than 400 visitors in 2009. More special events are in the works. The Colonial Beach Artist Guild donates the proceeds from the art show and also from sales of their boxed greeting cards to the Historical Society and Museum, the Chamber of Commerce, the elementary and high school art departments and the Concerned Citizens Community Center fund through the Colonial Beach Foundation. Other community activities include participation in the now-defunct Market Days and the Boardwalk Arts & Crafts Festival where guild members works are on display and for sale. They have even inspired the opening of a couple of local galleries: The WideRiver Gallery (closed 2012) was located next to The Espresso Station, held different monthly exhibits, classes and even offered dance lessons! Owner and Artist Connie Canby also featured stained glass art, jewelry, pottery and more. The Jarrett Thor Fine Arts Gallery recently expanded into an adjoining space at their location on Taylor Street. This not only gives the gallery more space, but also provides room for owners Carl and Joyce to each have their own studio. Their town beautification projects are an inspiration! The group meets on the third Thursday of each month in the evening at Colonial Beach Baptist church. They were named "Business of the Year" for 2009 by the Chamber of Commerce! Colonial Beach Artists Guild, Inc.